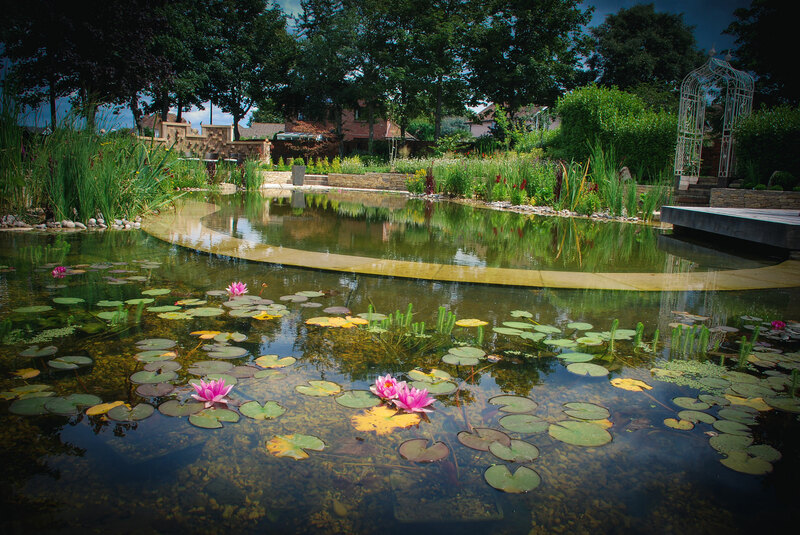 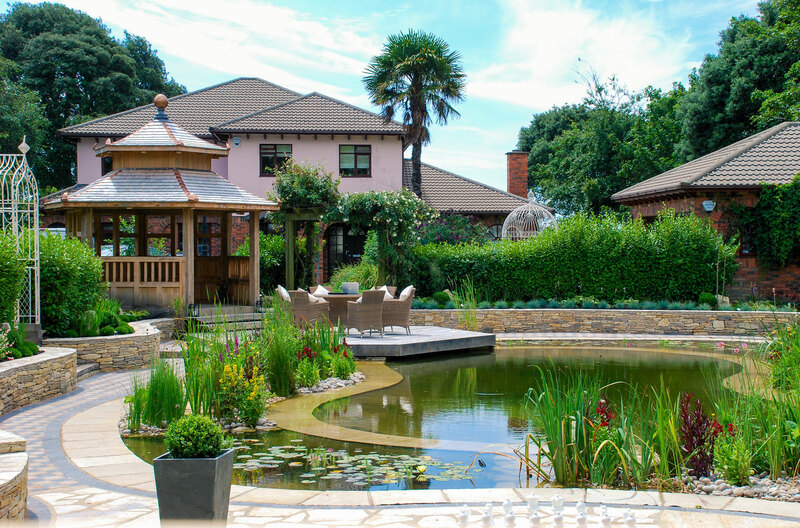 To create a naturalistic landscape surrounding a large, centrally situated natural swimming pond, and for the garden to take you on a journey along interesting paths leading to areas for entertaining and relaxing with the family. 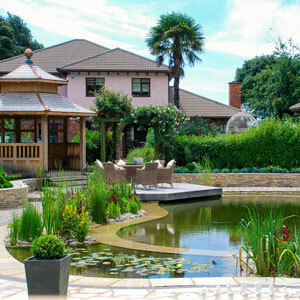 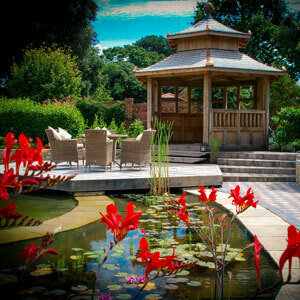 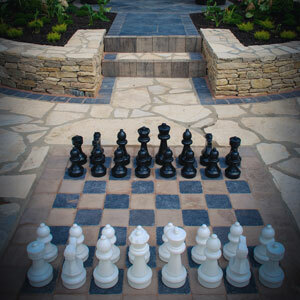 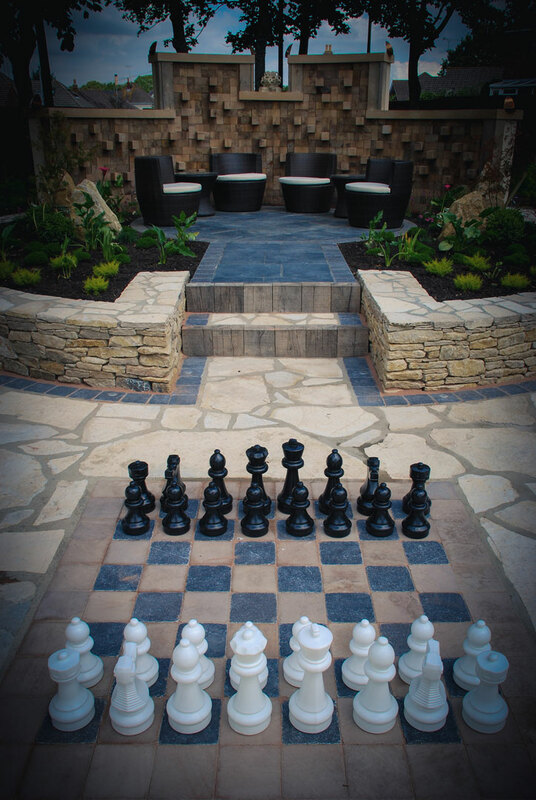 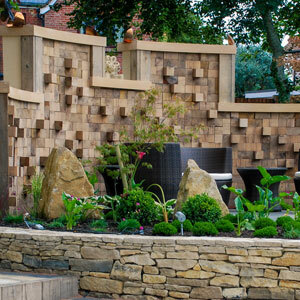 With a focus on the garden giving that ‘wow factor’, every idea was developed meticulously to ensure this was achieved. 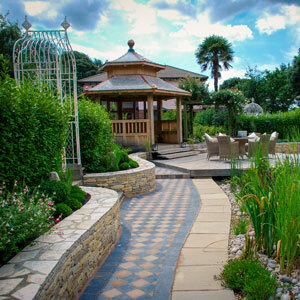 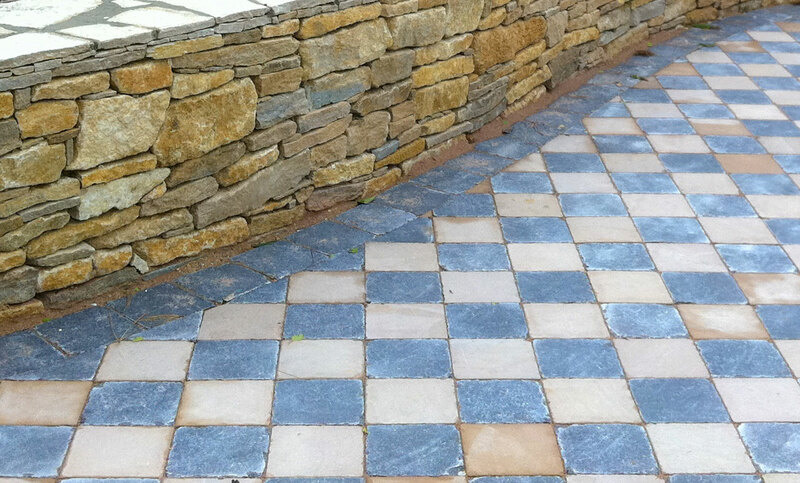 Locally sourced Purbeck stone was used throughout the design. 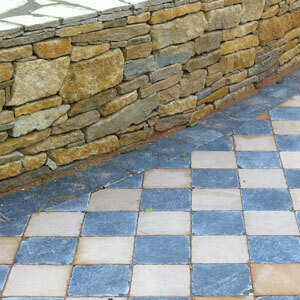 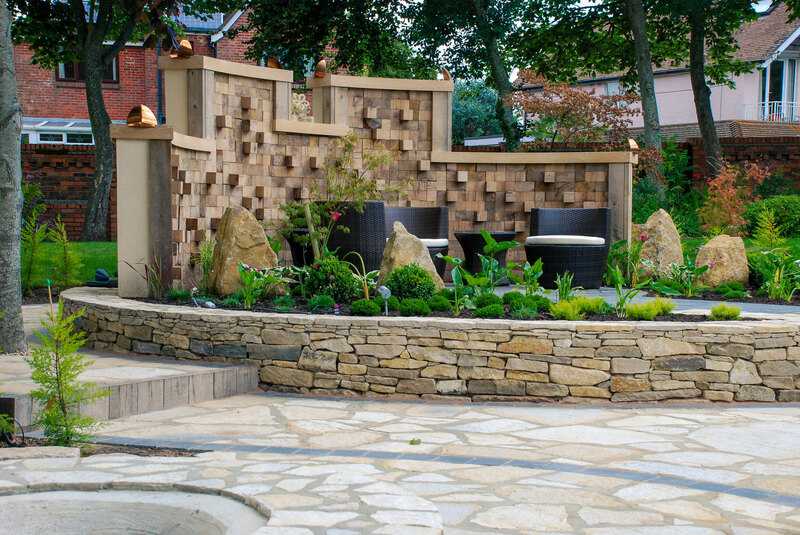 Repeatedly using this material for the dry-stone walls, the patio and the large boulder seating helped give the garden a natural organic feel. 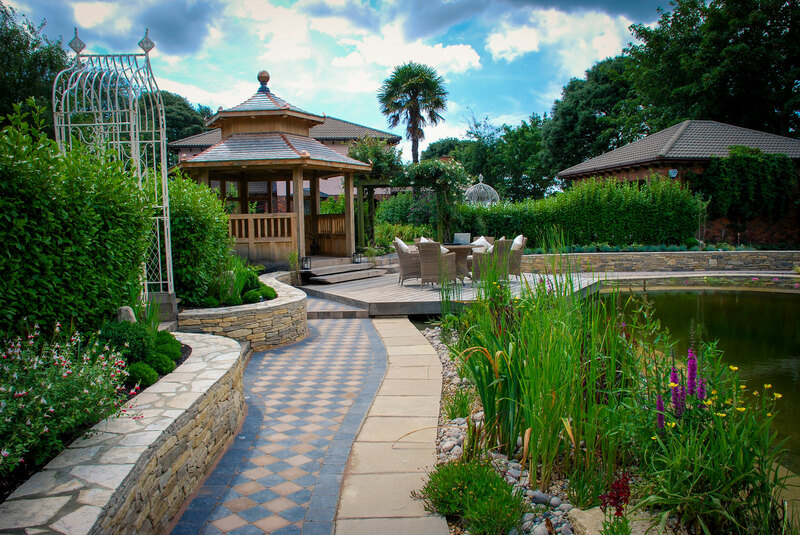 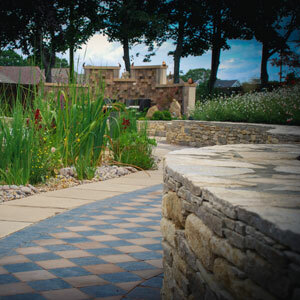 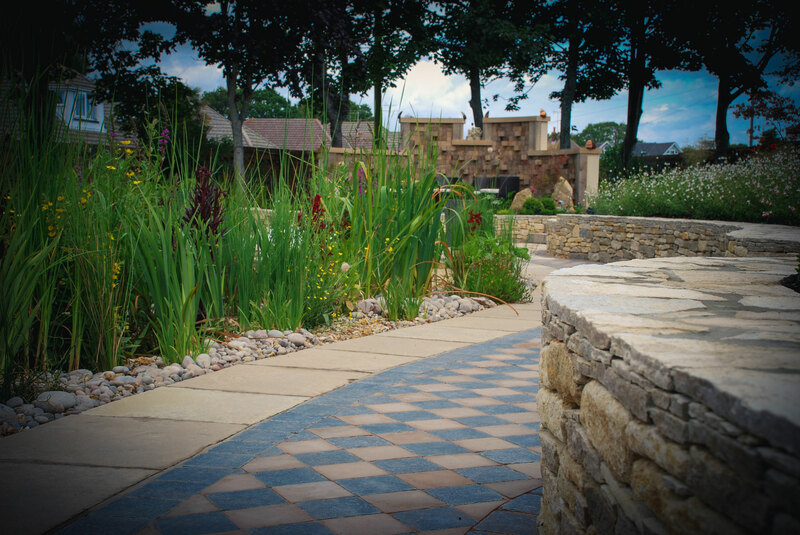 The unusual use of the chequered paths that run around the pond represent the fun side of the garden but they also complement the stonework. 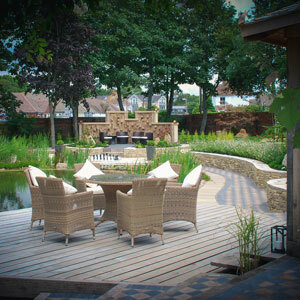 There are several areas for entertaining in this garden. 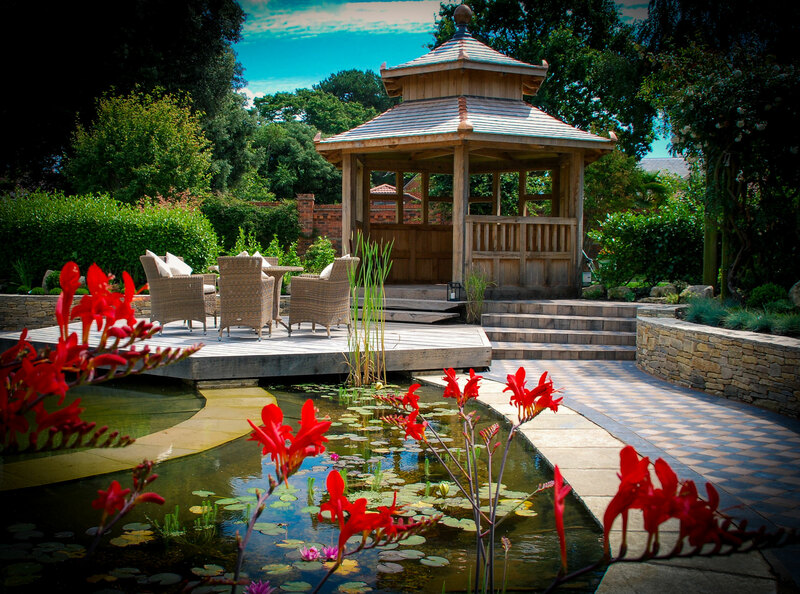 On entering, there’s a beautiful hexagonal gazebo and large cantilevered deck, which is a great place to enjoy the evening sun whilst watching the Koi carp in the pond. 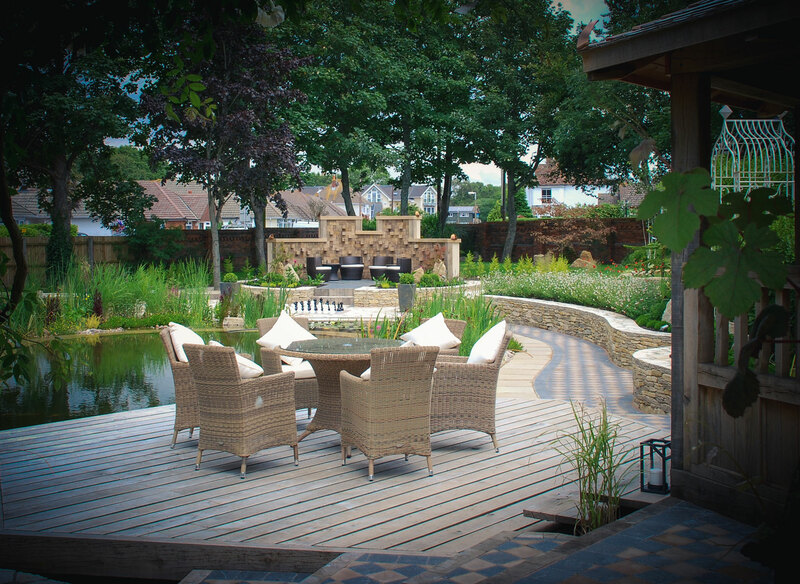 At the opposite end of the garden, is a raised seating area with a bespoke oak sculpture, which also acts as a privacy screen and gives a different viewpoint. 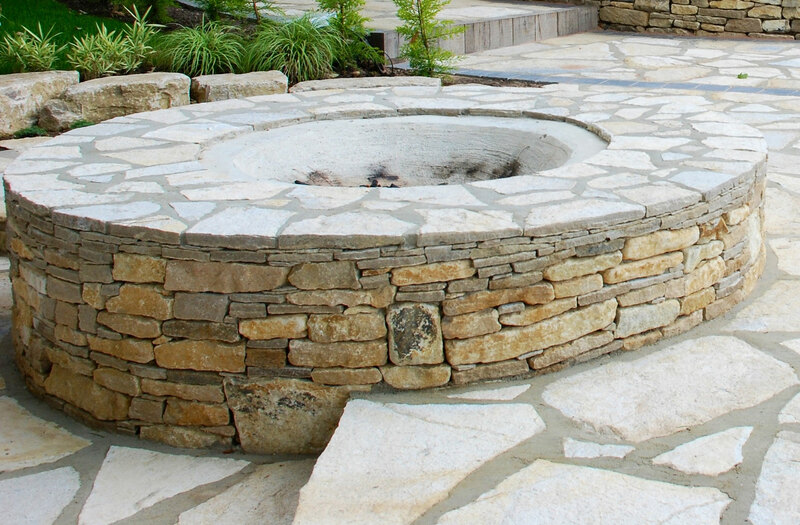 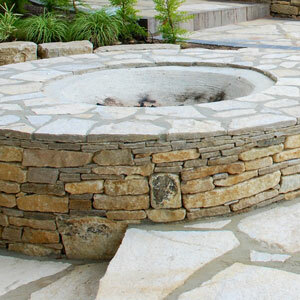 When the day draws to an end, the fire-pit with large seats formed by giant Purbeck boulders, is the perfect place to have a barbecue and keep warm. 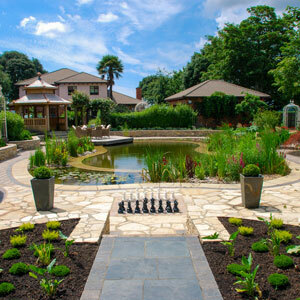 Spring and summer flowering perennials anchored with various shaped topiaries form the planting scheme. 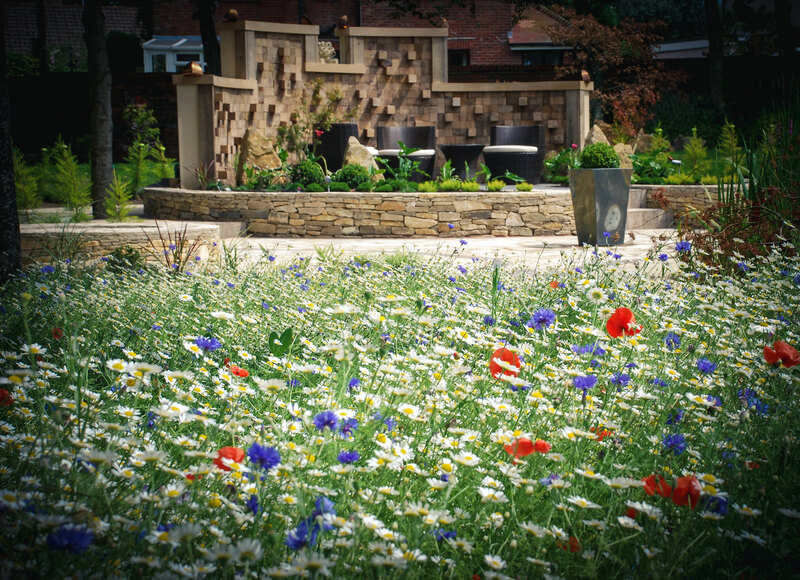 Purple Iris and large white poppies are the highlight in early spring, with drifts of colourful summer perennials such as salvias and crocosmia blooming soon after. 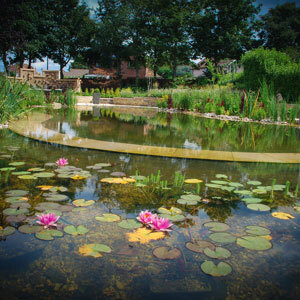 The pond has large clumps of mature lilies, and is edged with marginal reeds and other moisture loving plants. 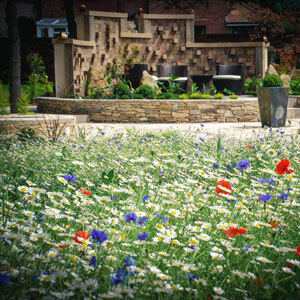 A large wild-flower area looks stunning throughout the summer and attracts bees and other insects to the garden. 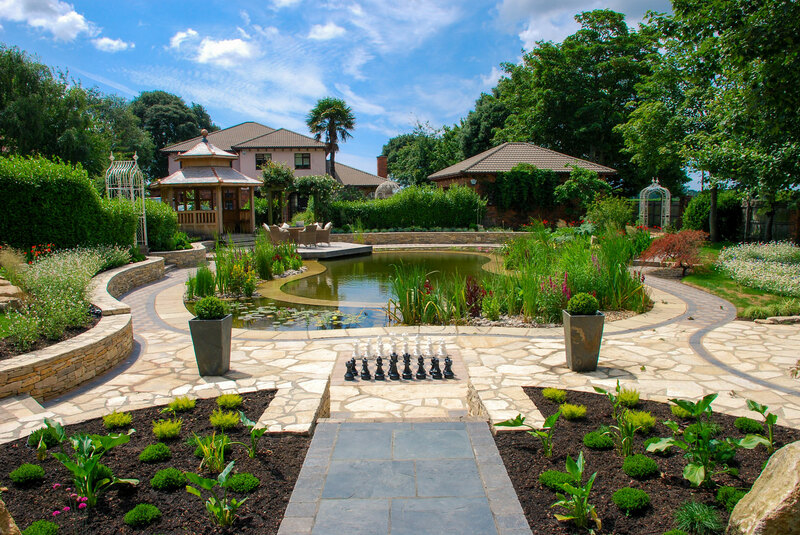 Around the perimeter, a number of large trees and shrubs have been placed to give protection from the elements, and a mixture of both native and exotic plants complete this tranquil, relaxing garden where wildlife is encouraged and enjoyed.